Personal Capital is a client-centric robo-advisor offering investment and wealth management services. The company distinguishes itself from the competition by combining automation with personal service. With 1.4 million users, Personal Capital currently holds $8 billion in assets under management with 1.9 million users who have reached their financial goals. Unlike many financial apps designed to make investing more accessible, Personal Capital is a robo-advisor for those who already have some established wealth. They’ve gone back and forth on the minimum investment required, which is now set at $100,000. Its goal is to provide a more transparent and affordable investment platform. However, it does target clients with larger assets, with higher fees being assessed with the fewer assets you let the company manage. We’ll get into the specifics shortly, but the upside to potentially paying higher fees is the access you get to financial advisers to help with your investment strategy. The company utilizes five principles for investing: the modern portfolio theory; personalized asset allocation; tax optimization; equal sector and style weighting; and disciplined rebalancing. No matter how much in assets you’re looking to invest, consider Personal Capital if you prefer a hands-on experience or if you have a large portfolio to open or transfer. Either way, we’ll take you step by step through the different types of accounts you can have with Personal Capital, as well as the fees you’ll pay at different asset levels. You’ll also learn about the special features that make Personal Capital unique, including financial tools and expertise. If you’re looking for an online advisor for any or all of your wealth management, see if Personal Capital is right for you. 6 Who is Personal Capital Best For? There are three different plans available at Personal Capital, which are divided up based on how much investable assets you have. If you know how much you’d like to invest, find the correct category to learn about the benefits and services you’d receive from Personal Capital. Then keep reading to learn more about the fee structure. The first is called Investment Service, targeted for those with up to $200,000 in assets to be invested. Services include access to a financial advisory team, a tax efficient ETF portfolio, dynamic tactical weighting, 401k advice, and cash flow & spending insights. You’ll also get to use Personal Capital’s online tools for free and your online dashboard. You do, however, need a minimum of $100,000 to get started investing with Personal Capital. The next option is the Wealth Management plan, for those with investable assets between $200,000 and $1 million. You get access to all the benefits from the Investment Service plan, plus several others. These include two dedicated financial advisors, customizable individual stocks and ETFs, a full financial and retirement plan, college savings and 529 planning, tax loss harvesting and tax location, and financial decisions support. The financial decisions support refers to help with insurance, home financing, stock options, and compensation. Also, note while your advisors can help you plan for accounts like a 401k for retirement or a 529 for college savings, Personal Capital doesn’t actually offer these accounts. If you have more than $1 million in investable assets, you qualify for the Private Client Plan. Again, you receive all the perks of the previous two plans in addition to several more. To begin, you’ll get priority access to CFP, advisors, investment committee, and support, plus an investment portfolio mix of ETFs, individual stocks, and individual bonds (in certain situations). You also receive family tiered billing; private banking services; estate, tax, and legacy portfolio construction; and donor-advised funds. Personal Capital also offers private clients a private equity and hedge fund review, deferred compensation strategy, as well as estate attorney and CPA collaboration. The more money you invest through Personal Capital, the more money you’ll save in fees. If you invest up to $1 million, your fee comes to 0.89% of the assets being managed. If you invest more than $1 million, your first $3 million in assets are only charged a 0.79% fee. Then, your next $2 million in assets are charged 0.69%. The $5 million after that are charged 0.59% and the next $10 million are charged 0.49%. However, there aren’t any charged beyond the account management fees, so you don’t have to worry about annual, transfer, or closing fees. So what types of accounts are supported through Personal Capital? There are many: both individual and joint non-retirement counts; Roth, traditional, SEP, and rollover IRAs; and trusts. Through your Personal Capital investments, you can expect a healthy range in your portfolio. For example, when buying U.S. equities, they buy a diversified sample of at least 70 individual stocks that epitomize their tactical weighting approach and optimize your account for tax purposes. Personal Capital also only purchases liquid securities, so that if you ever need to access cash quickly, you can receive funds within a settlement period of just one to three days. Funds are held by Pershing Advisor Solutions, a Bank of New York Mellon Company. It is one of the largest U.S. custodians and currently holds more than a trillion dollars in global client assets. Personal Capital uses several techniques and strategies to ensure clients are optimizing their taxes on investments. First, they entirely avoid mutual funds, which they regard as inefficient for tax purposes. Their asset location is personalized whether you have taxable accounts or retirement accounts. For example, Personal Capital typically places high-yielding accounts and fixed income into a tax-deferred or exempt account. REITs are also generally placed in retirement accounts because they pay nonqualified dividends. Finally, Personal Capital utilizes tax loss harvesting, meaning they use individual securities that realize losses and can, therefore, offset gains or provide a tax deduction. You can take advantage of some of Personal Capital’s online resources without even becoming a client. Just by creating a login account, you can link all of your financial accounts for an investment checkup. The program analyzes your bank accounts, credit cards, and investments to create recommendations on your asset allocations. You can then choose whether or not to make those adjustments to your investments. Additionally, you can check holistically on how your investments are performing by taking into account how much you’re charged in fees. You can do this in one of two ways. The first is through the Mutual Fund Analyzer, which you can compare performance (with fees) against the broader markets. Then you can use the general Fee Analyzer to see what you’re being charged on your non-taxable retirement accounts. In addition to an investment checkup, you can also use Personal Capital for a budget check-up that analyzes your saving and spending. You can even incorporate their Retirement Planner for long-term savings projections. You’ll be provided with a number of different scenarios, including best case, worst case, and most likely. It gives you a good idea of what you could potentially expect when you’re finally ready to retire. 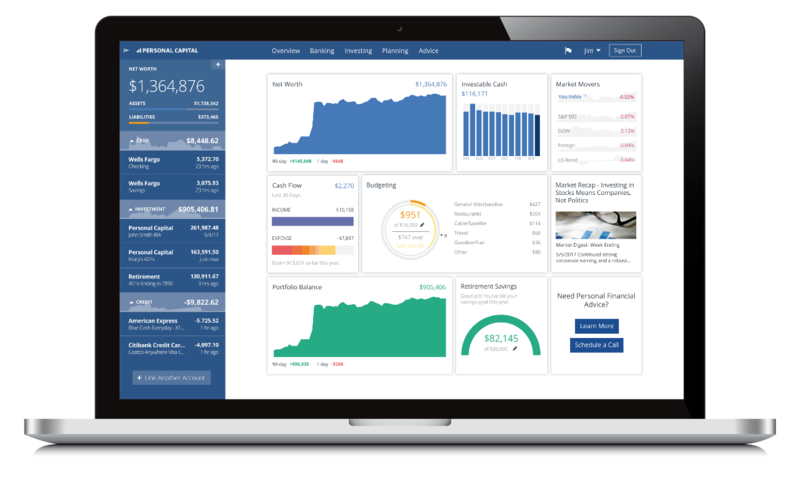 All of these features run through the Personal Capital dashboard, so you can get a holistic view of your entire financial picture. As we mentioned earlier, Personal Capital implements five distinct strategies for investing. Learn a bit more about each one to get a better grasp of how your money would be managed by this advisor. The prime directive here is to create an efficient portfolio for clients while yielding the highest possible return for the lowest possible risk. Personal Capital works with six asset classes to provide this equilibrium, which are all meant to be liquid and broadly investable. These asset classes are U.S. stocks and bonds, international stocks and bonds, alternatives (including ETFs and commodities), and cash for liquidity. There’s a reason the company is called Personal Capital: they understand that no two investors are exactly alike. That’s why they look at your individual data and financial goals to balance your portfolio’s risk and growth. They use a proprietary Retirement Planner software that analyzes your spending and savings habits in addition to your projected income. This helps you determine what your financial future looks like and what you may need to change to reach your future goals. We mentioned earlier that Personal Capital optimizes your taxes by using tax loss harvesting and asset location, as well as avoiding mutual funds. In fact, these steps could boost your annual returns by as much as 1%. While many advisors use one or two of these tactics, Personal Capital offers a truly robust strategy for tax optimization. Personal Capital’s strategy for diversification involves equalizing the composition of your portfolio by sector, size, and style. The goal is to prevent bubbles and other volatile conditions from adversely affecting your investments too much. Likewise, they don’t rely on a few large companies but instead spread out U.S. stock investments between 70 and 100 different stocks. Your portfolio receives a daily review for any potential rebalancing needs. For high-level assets, they’re typically rebalanced when they deviate more than a few percentage points the target. Specific securities receive a smaller margin and are reviewed after just a 0.5% move from the target. Having a systematic review allows you to maximize your ability to buy low and sell high. Personal Capital offers truly extensive services for higher asset investors, particularly considering the low percentage of fees charged. This is especially true if you’re an investor with several million dollars in assets and who likes to have easy access to a dedicated financial advisory. After all, in the Private Client tier of $1 million+, you can get advice on just about anything related to your finances, whether it’s about retirement, real estate, or anything in between. That’s on top of the personalized asset management, so you have a one-stop shop of both automated algorithms and a human point of contact who understands the larger picture concerning your finances. Personal Capital also makes it easy for this type of investor to remain passive. If you appreciate their total investment strategy and like how the allocation and review processes, then you don’t have to do much on your own.